Rick Wormeli, one of the first National Board–certified teachers in America, brings innovation, energy, validity, and high standards to both his presentations and his instructional practice, which includes 38 years of teaching math, science, English, physical education, health, and history and of coaching teachers and principals. 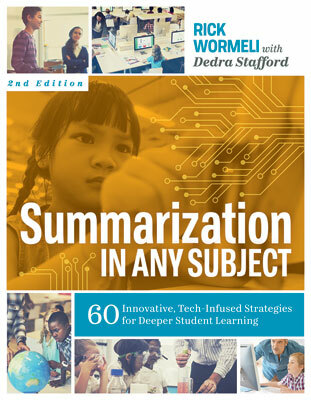 Wormeli's work has been reported in numerous media, including ABC's Good Morning America, MSNBC's Hardball with Chris Matthews, National Geographic and Good Housekeeping magazines, What Matters Most: Teaching for the 21st Century, and The Washington Post. He is a columnist for AMLE Magazine and a frequent contributor to ASCD's Educational Leadership magazine. His classroom practice is one of the showcases for ASCD's best-selling series, "At Work in the Differentiated Classroom."